Indian Head Massage has been used in India for thousands of years to treat mind and body. It’s a combination of ancient techniques and modern awareness of the importance of and holistic approach. Did you know some treatments are covered by your health insurance? 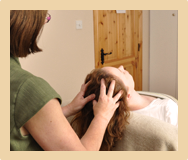 Some of our treatments are covered by AVIVA, LAYA HEALTHCARE and VHI - available on selected health insurance plans. Contact your health insurance provider for more details. “When I got pregnant I decided to have Reflexology after it was recommended to me by my cousin who is a nurse. I found it so relaxing and it helped me sleep better at night. I found it also helped relieve my fears and anxiety about labour.